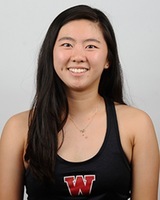 Although largely overshadowed by three-time NCAA DIII Individual Singles champion Eudice Chong ’18, Victoria Yu ’19 has had a successful tennis college career in her own right. After playing in the second singles and first doubles spots in dual matches for the women’s team this past spring, Yu reached the semifinals of the NCAA singles tournament, which Chong won, before capturing the doubles title with Chong. This year, Yu and Chong have been on a tear, capturing doubles titles at the MIT Invitational, the ITA New England Regional Championships, and the ITA Oracle Cup, before ultimately falling in the quarterfinals of the ITA Fall National Championships at Indian Wells, Calif., where they competed against top Division I doubles teams. The Argus sat down with Yu to discuss doubles, her motivations, and the exhausting nature of tennis. The Argus: You won the doubles championship last year with Eudice—what are your goals this year? Victoria Yu ’18: A definite goal for the team would be, like the past two years we made it to the round of 16 and just barely missed qualifying for the elite eight, which is at the national site, so that’s definitely a very reachable goal that we have, and I don’t see why we can’t end up winning the whole team championship. Individually, I think a goal would be to qualify for the singles and doubles again. I assume I’m playing with Eudice [Chong ’18], but I’m not sure yet; it depends on what the coaches do the lineup as. Last year I had a good run in both singles and doubles, [so to] do as well would be great. A: Doubles is often viewed as less physically demanding than singles—in what ways is this a misconception? VY: In the aspect that you’re not covering the whole court, you can see it as not as physically demanding, but every point is a lot faster, and when you’re at the net, it requires faster reaction times. It’s probably a little bit faster-paced than singles, so that plays a part in the physicality of it. A: Why do you play tennis? VY: I started playing tennis because my older brother was playing tennis, my parents just put me in it, and right now, I’m still playing it. I guess I really enjoy the sport, and I’ve been playing it for so long it’s a part of me. I can’t really imagine not playing tennis, I’ve been playing for so long. A: What about tennis do you find so enjoyable? What keeps you on the court every single day? VY: I would say that looking back, there’s a lot of aspects of tennis that mirror life itself, and the skills that you develop when you play any sport really; it’s really an advantage. I like the competition—it’s hard to say when things aren’t going your way, but in hindsight, part of me likes the competition and the fight. A: Who do you look up to, tennis-wise? VY: I don’t really have a professional idol. I would say I do look up to Eudice. She obviously does very well in everything, and playing with her gives me a different point of view than if someone is just looking in on the outside, at like, “Oh, she’s just successful and stuff,” but playing with her, I know she has a really good work ethic, and she trains every day to get better—that gives me motivation. A: In regard to your recent doubles tournament in Indian Wells, Calif., how do you feel you performed against top DI doubles teams? VY: I think our skill level is definitely up there with them, and they’re good, but we can compete with them. It also showed us that, like the last match, that we didn’t compete as well, we didn’t play our best, and then it went the other way. But it’s hard to obviously play your best every single match, and it’s just something you have to work through, I guess, and accept it. A: What are some of the weaknesses in your doubles partnership with Eudice? VY: I don’t know if there are any blatant weaknesses. I think, most of the time, if we find ourselves in a tough situation, it’s either one of us or both of us aren’t playing our best, which just entails not executing our shots or missing shots we would normally make—I think that’s a big part of it. A: But you never feel like you’re being outplayed? The reason you’re losing is always on account of yourself? VY: Yeah, well, especially in D3, we haven’t been super challenged. Maybe in the last match we played, even if we did play better, we might’ve been outplayed. I kind of have, not regrets, but kind of, like if we’d played our best, who knows if we could’ve won—we might’ve not—but we didn’t, so we’ll never know. Yeah, I don’t necessarily think that we’ve ever been challenged to a point of being outplayed, besides the last match. A: On the flipside, what are some of the strengths in your pairing? VY: I think we both have good volleys, we’re very active at the net, which is a big part of doubles. Eudice, from the baseline, she has really big groundstrokes, which sets me up nicely at the net—I can move and finish volleys. I would say our strength is movement and aggressiveness at the net. A: Tennis is a very demanding sport. How do you overcome the physical and emotional exhaustion that is associated with playing and practicing many times a week, and with often times playing multiple matches in a day? VY: I guess a huge part of it is the team—they’re always there for you. In the spring when we do dual matches, it’s usually one singles, one doubles, but this past fall, we played tournaments where we had multiple matches. I guess it’s just knowing that you’re not just playing for yourself, you’re playing for the team and the team is there, and they’re supporting you and cheering you through each match. And knowing that, feeling their energy, reenergizes you.